I’m on my way to Yoga. I've only been practicing for a year. I hope to say I’m still at it at the end of 2018. I practice to relieve the stress of fires and shootings and divisive politics although I do believe there’s such a thing as good stress as well (or is that an oxymoron? )—performing live, planning travel, a GRAMMY nomination. If you’re in a business that challenges your resilience (or not) it’s invaluable to have a safe place to go where you can press pause. As for my body—it’s definitely way more limber than it was a year ago. I no longer feel so brittle that my whole leg might snap off and fly across the room when in Happy Baby. I no longer dread having to bend down to pick up something from my kitchen floor for fear of not being able to rise again. I make a left on Ventura and drive past a Bikram Studio. No. Just no. I don’t get Hot Yoga at all. I really think they should call it “Slippery Yoga” cuz it makes me feel like a fish. WHAT is the point? So much sweat on my skin I can't possibly stabilize a pose....and in my eyes—how can I know what shape to strive for if I can’t see the instructor in the front of the room? Plus, it’s smelly. I suppose Hot Yoga makes sense in Boston, but here in sunny California, going from 100° outside to 100° inside isn't very inviting. I much prefer a pleasant 68° Fahrenheit….geranium oil in the diffuser. That’s my jam. Here I come. Driving...Thinking...Driving...Thinking…in fact, I must remember to make note of all these things I'm thinking when I'm finished driving so I’ll be able to empty my mind on cue once I'm "on the mat"—do I have enough parsley for the pasta? where the f*ck did I put that receipt? could that third line in the second verse be stronger? (You know the list. You have one too.) The enlightened instructor always assures me that everything will still be there when class is over. But this is where he (or she) is WRONG. I know it won’t be. Better safe than sorry. Where's a pen? I pass what appears to be the end of an AA meeting: a small crowd outside a church, holding coffee cups and cigarettes. I’m going to a meeting too. AA for my soul. I try to get to one a day if possible. Check in with myself. One vertebra at a time. 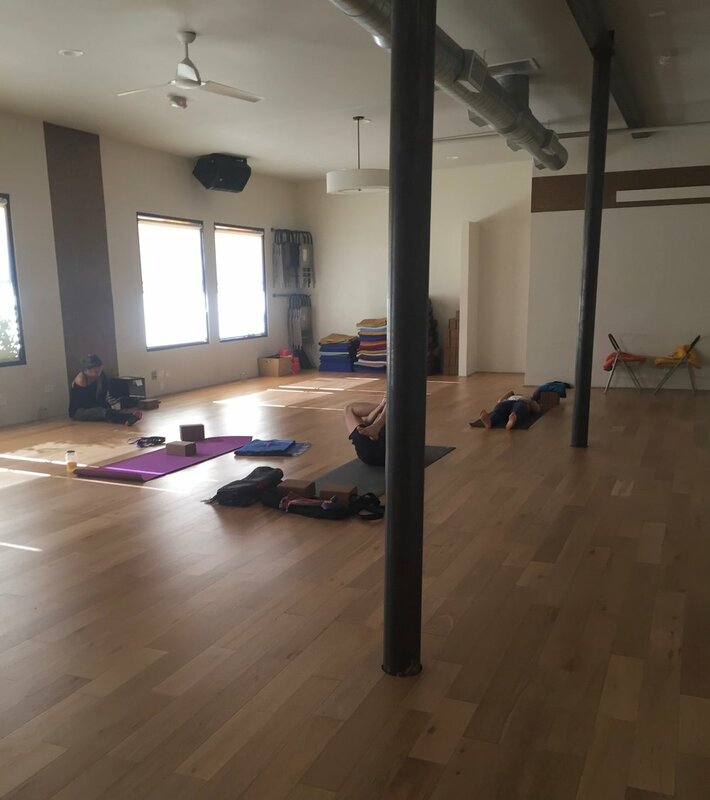 I wrote about my first yoga class last January…right around (or perhaps exactly on) Inauguration Day when our country started falling apart at the seams. I needed something for the pain besides Ketel One so I signed up for a 6 month series at Black Dog. Now I sleep around. I want to check out different instructors and different spaces…notice if a softer voice or a higher ceiling alters my experience. Sorta like Songsex with different partners. Now, I can bend a little farther than I did yesterday, find a little more balance, breathe a little more steadily. My mind may wander…(you know—the parsley), but it always comes back. That’s the important thing. Life is a rollercoaster…but for an hour and a half every day I can disconnect. At the very end of practice, unless an instructor is sadly unconventional, we assume Shavasana. This is my favorite pose. It’s like a reward for having done the work and now we get to lay on our backs, listen to Bon Iver or Goldmund and do NOTHING. Except I always do this one thing…I cry. Always. I can’t NOT cry during Shavasana. With all the blessings bestowed upon me it’s still been a tough year. The tears are for loved ones I miss and a few dear friends I’ve lost. Some are tears of relief—after a personal journey of self-identity, my work has been recognized and I’m coming out on the other side with some closure. Left on Moorpark. Right into the lot. I’m here. Parking. This is where I make my list of stuff I don't want to forget. Then I’m going in. And after my ohm and Namaste I'll be better at bearing discomfort, breathing through a heavy heart, self-forgiveness, letting go. At least for one more day. I am a warrior. I wake up every morning and practice being brave. Every day is another chance to try. Soon enough I will leave this world and still not have “the answers.” That’s okay. I’m ready for another year. Bring it on. There’s my mat. Thank you for reading. Sign up for this Blog! Please give a like to my Serial Songwriter Facebook Page, Follow me on Twitter and Instagram. Check out my whole website. Buy my book. And Have a Happy, Healthy New Year.